A daughter whose two parents were taken into custody by ICE Wednesday made a heartfelt plea for their release. Margarito Silva, 60, and his wife Concepcion Barrios, 50, were taken into custody when they went to visit their pregnant daughter and son-in-law who live on Fort Drum military base in upstate New York. The couple presented a New York City identification card, which the city allows any resident to receive without regard to their immigration status, but a spokesperson for the Army base said that was not an accepted form of identification. "For my family, our dream was... simply for my whole family to come together and live a life of happiness in our home," their daughter Perla Silva said at a news conference Wednesday. "On the Fourth of July, my family and I decided to visit my brother-in-law and my sister at Fort Drum military base where they live to celebrate Independence Day -- a day of freedom. On this day, my parents' freedom was taken away from them. My family and I are devastated by what happened to my parents," she said. "Now, my daughter cries out every day that she wants her grandparents home: 'What time are they coming home?'" she said. The couple had used the IDNYC cards to enter military bases before to visit their relatives when they were stationed elsewhere, according to their daughter and a spokesperson for Make the Road New York, an immigrant advocacy group. 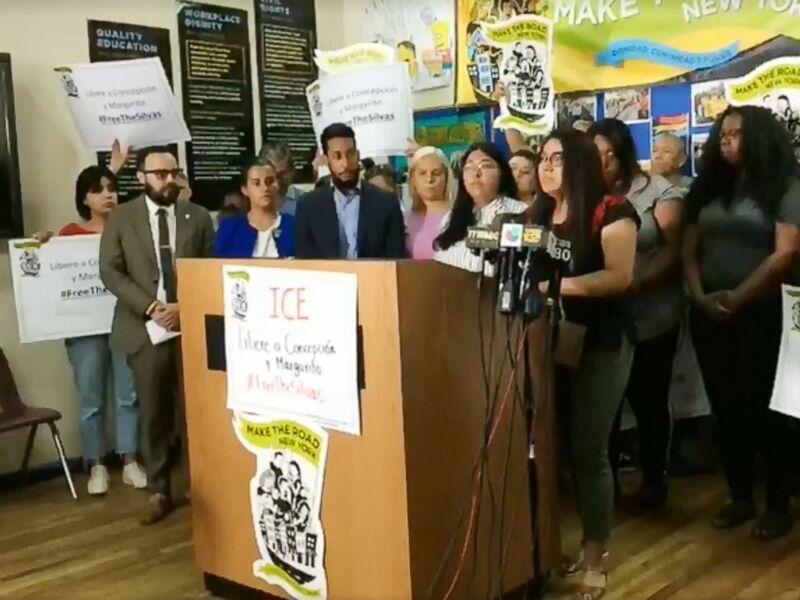 Perla Silva, pictured at the podium, got emotional on July 11, 2018, while speaking about her parents arrest. Julie Halpin, a spokesperson for the Army at Fort Drum, confirmed the July 4 incident. "Fort Drum Security personnel asked for a second form of ID, and the individuals provided their Mexican passports, which did not include documentation of legal entry into the United States," Haplin said in a statement to ABC News. "This prompted security personnel to contact U.S. Customs and Borders Patrol as the agency with jurisdiction in this matter." Brooklyn Borough President Eric Adams was present at the news conference Wednesday and said that "what's clearly traumatic about this" is that they were visiting their son-in-law who is a part of the military. "His blood is good enough to give his life for the country but his family's lineage and blood is not good enough to stay in the country," Adams said. The specific details about the couple's immigration status and their legal case were not addressed at the news conference, at the request of the family given the ongoing nature of the case. Daniel Altschuler, the managing director of Make the Road, said that the couple was then arrested by CBP officials and taken to Buffalo Federal Detention Center where they remain in ICE's custody. Altschuler said that according to ICE, the couple has no prior criminal record and no prior interactions with ICE. 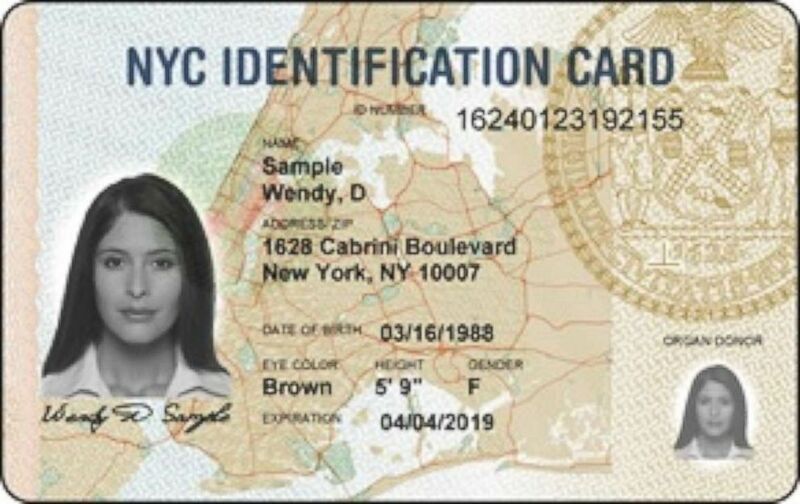 New York Identification Card is pictured in this undated photo. Perla Silva stressed that both her parents have recently undergone surgeries -- including heart surgery for her mother -- that require medication and follow up appointments with their trusted physicians. "Who can assure us that they're being taken care of the way that they need to be? We can't wait any longer. We can't have them sit around in there anymore. We need to get my parents out now," she said. Perla Silva said that she last spoke to her mother Tuesday night and that her mother said that she had some kind of incident with her cellmate. "She was not doing very good," Perla Silva said of her mother, adding in Spanish that her mother said she felt that she was in danger.